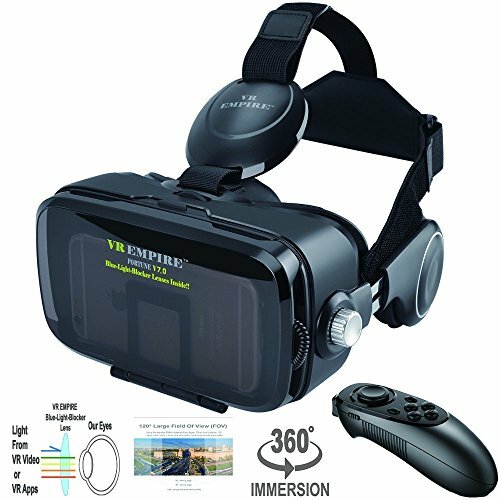 2018 New VersionVR EMPIRE Virtual Reality headset is a newly designed based on improvements of other VR headsets, New conception and perfect materials are built in it. This is the best choice to experience 360° immerse VR technology's trends & spectacular! FOV: maximum 120 degree view angle. NOTE: The OK button in all vr headset on Amazon market doesn't support Iphone's Google Cardboard, But you could move or shake a magnet near the Iphone's top-left area(the intersection area between start button and camera) to play and interact iphone's Cardboard app after your head control circle enlarged. The OK button works well for Android smartphones' Google cardboard. You could download and scan VR EMPIRER reviewer QR code in the images collection area where you could get it by clicking on the big product image). Go to Youtube: https://www.youtube.com/watch?v=x3ygO_3UChw to see more information.